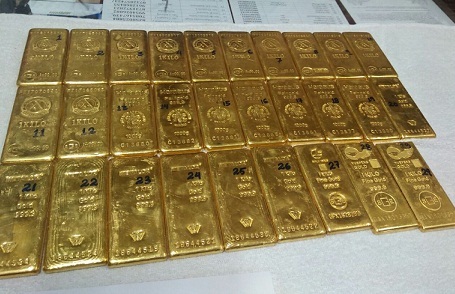 Contraband gold is increasingly entering Calcutta from Myanmar via the northeastern states. Northeasterners figure at the top of the list of those who have been arrested in Calcutta this month with illegal gold consignments. Many locals have been also been caught after they received gold consignment from northeasterners who had managed to flee. Revenue intelligence officials say contraband gold is increasingly entering Calcutta from Myanmar via the northeastern states. They say Bangladesh was earlier at the vortex of this contraband gold trade but huge seizures there have now forced international gold smuggling cartels to turn to Myanmar. On 25 March, Mahesh Rai and Rezina Farchinsungi alias Rita Maisak from Manipur were arrested with 5 kilograms of gold in a small hotel on Calcutta’s Sudder Street. Maisak later confessed to DRI sleuths that the gold consignment had been handed over to her at a place near the Myanmar border. The two were caught before they could deliver the package to the intended end-user in Calcutta. Next day, on 26 March, Isak Lalpewkluwa from Mizoram was caught with 3.5 kgs of gold from a small guesthouse in Calcutta’s Salt Lake. He also confessed to getting the gold on the Myanmar border with instruction to hand over to end-users in Calcutta. In both cases, the Northeasterners had been used as couriers and they had taken the long land route to Calcutta from their states. Revenue intelligence officials say that subsequently three locals have been caught with more than 10 kilos of gold from central Calcutta. They confessed of receiving their consignments from couriers hailing from Northeastern states. The gold had come from Myanmar. Officials say that international gold smuggling cartels, who see India as a huge market, have turned to Myanmar instead of Bangladesh which was earlier their favourite courier point. The enforcement activity in Bangladesh has led to huge seizures and that may explain why Myanmar has been chosen to route contraband gold into India.